Years ago, I read Sangu Mandanna’s debut novel. While I wasn’t exactly blown away, I thought it’d be worth returning to her work later on in her career. So when I heard about her second book, A Spark of White Fire, a young adult sci-fi novel inspired by the Mahabharata, I decided to give it a go. And as it turns out, she’s really grown as a writer! 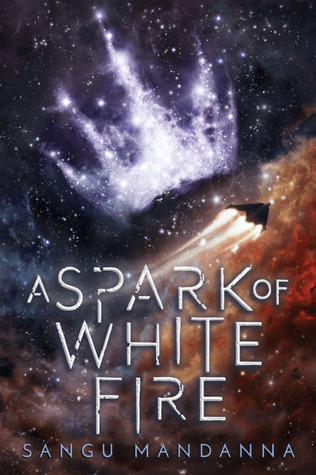 A Spark of White Fire is an entertaining entry to the field of young adult SFF, and I have a hunch that it’ll be one of my favorite YA novels of 2018. This sounds good! I haven’t seen it around much but I’m going to take a closer look. I do love the idea of a world with limited weapons for fighting. I think it’s a cool idea too! Well that is GREAT news. I felt the same way about Manganna’s debut novel — it was cool and interesting but didn’t blow me away — and I’ve been hoping that her second book would show growth as a writer. What glorious news that it does! And it sounds forking fantastic to read a book in a fantasy world that does not contain sexism or homophobia. Sounds relaxing as hell this week. I also like books that mix up science fiction and fantasy, so this one was fun for me.